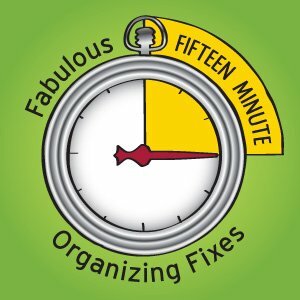 Thanks for stopping by for this week’s Fabulous 15 Minute Organizing Fixes! If you’re catching this for the first time, the idea of these is NOT to get your whole home organized but rather, to inspire you to find a mini-project that makes a major impact in your everyday life. We know from working with thousands of clients that often times just taking one little baby step in organizing can give you huge motivation to tackle even bigger projects! And the good news is that if you can find just 15 minutes, you can get this done start to finish. So without further ado, this week we are taking action on a messy kitchen cabinet. You choose the one in your home that is driving you nuts. In my home, it was the cabinet where we store plastic dishes and cups for the kids, as well as lunchboxes and thermoses. When we moved into our home, we were thrilled to have this space. It’s worked great for giving the kids independence to get their own dishes for drinks, snacks, meals. Keeping that space organized, however, has been less than a thrill! 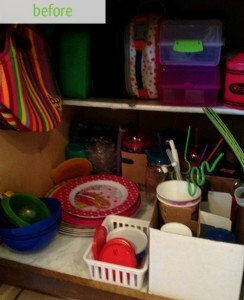 The combination of lots of plastic things that stack, water bottles that tend to fall over, and the fact that the kiddos are usually in a hurry as they grab from the cabinet, all added up to a lot of chaos. But that’s just at my house. You pick the one that’s bugging you, but we’ll follow the same process. Determine if there’s a better way to store the contents. I had re-purposed some wine glass boxes and drink caddies to help keep things from falling over. That worked, but it didn’t help with user-friendliness. I realized that the bowls are used much less frequently than plates, but for some reason they were stored in front of the plates. I also decided that by storing the plates vertically, the kids could grab the plate they are after without upsetting the whole stack. Find storage solutions that fit the space and the need. I had a few green bins from the dollar store in my container station, and they turned out to be just the right dimension for this cabinet. They are high enough to keep things from toppling over, and I was so fortunate that they fit three across. Plus, the handle opening makes it super easy to pull them out when needed. Leave some margin. 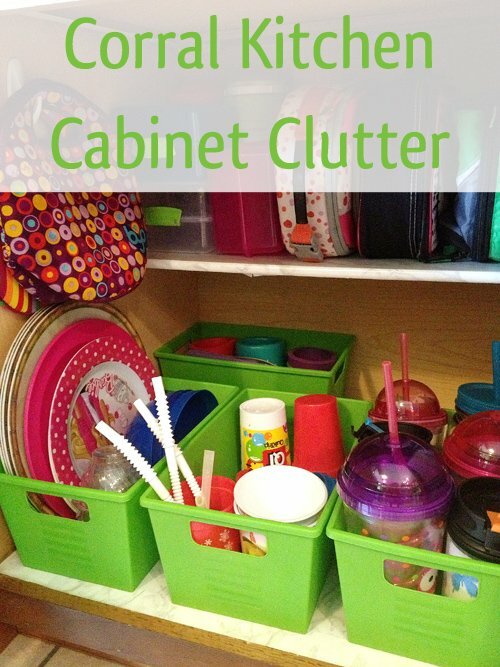 If the cabinet is full when you are finished, you’re just a few extra items away from more disorganization! Thanks to purging and using containers when possible to corral items, your cabinet should now have a bit of breathing room. Close the door, then reopen it to admire. You know you want to! It’s a small project, but it feels so good to have it done. It really is the little things, isn’t it? OK, your turn! Please share in the comments which one of your kitchen cabinets is driving you bonkers! Love the bins! These remind me of items from the Dollar Store, a great place to get wonderful inexpensive bins. Thanks for sharing! They are Dollar Store finds, indeed, Ellen. I wish I had snagged a bunch more when I bought those because they are not in stock anymore… the downside of dollar store solutions! Thanks for commenting!